You should check that a bit more closely and be sure it's an actual conflict. 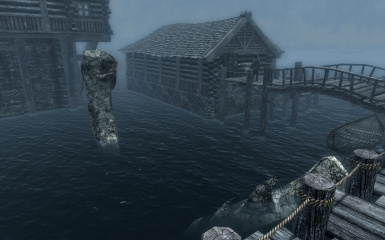 This mod merely carries the water height adjustment made by Update.esm and if that mod hasn't done so then it is in error and you should let this one win the conflict in your load order. Hmm. I think there's a little more to it, but it's proving a bugger to nail down. As far as I can see, the City Entrance Overhaul mod makes its own changes to the water height and the landscape, but it seems that your mod interferes with this. I've taken two comparison screenshots. The first is with your mod loading after the Entrance Overhaul. The second is without your mod at all. Yours isn't the only mod I use that affects this area and messes up the water height - Paradise City adds trees and causes the same issue, but it wasn't active in either of the above screenshots. I get that the common factor here is the Entrance Overhaul, but I want it to work well with your mod and Paradise City. I've tried making a patch but I always end up with the wrong water heights, regardless of which combination or load order I use. Can you lock out tag "related to tv/movies/other games"? Your mod is clearly referring to TES lore and not in example SW lore and i saw that few people started voting on this tag. It would be wrong if this mod got this tag. Love the mod adds to the immersion! One question about the mod, will there be an .esl version if not its okay. Thanks again for this awesome mod! At the risk of kicking the hornet's nest, didn't all of the Oblivion Gates spawn OUTside cities? I thought that was the only real defense the people of Tamriel had against the invading daedric hordes? Have I missed something? What they did with Oblivion was primarily a gameplay mechanic so that spawning the gate inside each of the cities didn't just end up wiping everyone out while you tried to clear it. 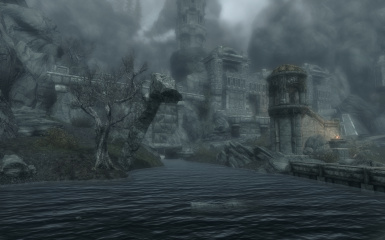 Offscreen lore isn't bound by that issue so one can put the gates inside the cities, like was done with Kvatch and the Imperial City later on. This is a must-have for me. Wow. What a cool addition to the world, nice little reminder of history. Thanks so much for all you do for us. Ah such a shame it isn't compatible with open cities. But once you go open you never go back. Mother of God.. You are the greatest lizard in all of Nirn! You might want to point that out in the compatibility notes so people don't think they have to choose. No idea, best way to find out is to try it on a test save and see what happens. Whiterun, Markarth, Riften, and Solitude all work great. Windhelms, unfortunately, spawns mostly blocking a new path JK put up. You'll have to use the console to delete a few things and just chalk it up to stormcloaks being industrious bastards. 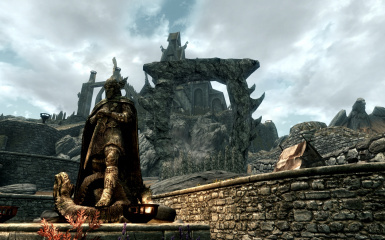 Yeah, RighteousRune is right, there is a conflict in Windhelm, but I'd like to point out that following the path leads to a Talos shrine and there isn't any actual reason to go to it, since you have the temple of talos already. If it matters to you though, I found you can use the console to disable half of the Windhelm gate and then you can use the path still (the gate is cracked so technically there are two separate parts to deactivate). Though, there is still an oddly placed brazier if you want to get rid of that too. 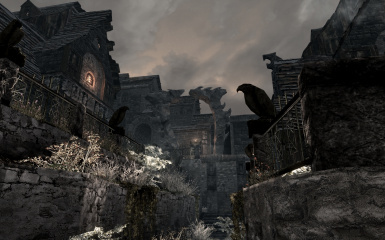 A patch is now available on the JK's Skyrim SE mod page which slightly adjusts the position of the Windhelm gate to better fit in with the JK surrounds. Patch made with permission. Thanks Arthmoor. Cheers. great concept, love the visual execution but I do have to point out that this isn't entirely lore friendly. The Gates wouldnt have appeared inside of the settlement walls as 3 gates were needed to be spawned to open a great gate that was needed to bring out the siege engines. If there were gates inside the city proper the city would've been leveled. One flaw in that: Imperial City. Nobody needed any great gates to open a bunch of portals there, directly inside the city right next to the Temple of the One. I have no idea what the logic behind needing a Great Gate for Bruma was when Kvatch fell to a standard gate right in front of the city gate. Especially since Oblivion gates could be opened anywhere the Daedra saw fit. Don't forget that about 200 years have passed since the Oblivion Crisis, and if there was damage to the city, it would be easy to rebuild. And yeah, there were Oblivion Gates in the Imperial City without a Great Gate spawned. 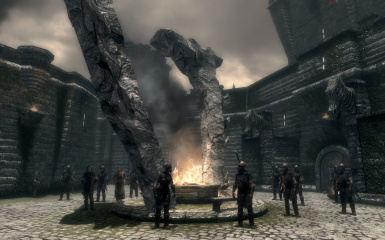 It's not like they couldn't have spawned the gates inside of the city, but it was probably some plot armor that the Oblivion Gates were outside of the other cities in ES4. Just to make it feel like we had time before we had to close them.